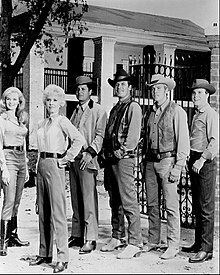 The Big Valley is an American Western television series which ran on ABC from September 15, 1965 to May 19, 1969, starring Barbara Stanwyck as the widow of a wealthy 19th-century California rancher and Richard Long, Lee Majors, Peter Breck and Linda Evans as her family. The series was created by A.I. Bezzerides and Louis F. Edelman and produced by Levy-Gardner-Laven for Four Star Television. Sierra Railway Engine #3 at the old Jamestown, California Depot, for the filming of the pilot episode of The Big Valley, 1965. The TV series was based loosely on the Hill Ranch, which was located at the western edge of Calaveras County, not far from Stockton. The Hill Ranch existed from 1855 until 1931, included almost 30,000 acres, and the Mokelumne River ran through it. The source is from an episode in which Heath is on trial in a ghost town with another man (played by Leslie Nielsen) and tells the judge how much land they have. Lawson Hill ran the ranch until he was murdered in 1861. His wife Euphemia (aka "Auntie Hill") then became the matriarch. During their marriage, they had four children, one daughter and three sons. Today, the location of the ranch is covered by the waters of Camanche Reservoir. A California state historical marker standing at Camanche South Shore Park mentions the historic ranch. In the first episode, titled "Palms of Glory", the grave of Thomas Barkley (1813–1870) is shown after it is commented that he fought the railroad six years ago. Later, in the same episode, Frank Braun reminds Nicholas, Jarrod, and Eugene Barkley about how "Six years ago, your daddy and mine fought and died for this" indicating the year is 1876. The episode "The Odyssey of Jubal Tanner" gives conflicting information. Audra states that her father died six years ago which would per "Palms of Glory" would point to 1876, but Jubal seems to imply that he has been gone 30 years since his wife Margaret Tanner's death, her grave marker showing that she had died in 1854 which would put the year around 1884. In the second season episode "Hide the Children", Nick Barkley makes reference that President Ulysses Simpson Grant is in the White House. Grant's term of office was from March 4, 1869 to March 4, 1877. In the fourth and final season episode "They Called Her Delilah", the telegram Jarrod received from Julia dated April 27, 1878 can be seen on screen. The later "The Long Ride" In season four episode , in which a friend of Audra Barkley was killed, a newly dug grave has a marker with the year 1878. Also in the fourth season episode "The Prize", Heath buries the wife of an outlaw, adding a grave marker dated May 5, 1878. So while the majority of episodes that give dates point to the late 1870s there are irregularities preventing that being stated definitively. In the episode "The Jonah" aired in 1968, the band at a town dance can be heard playing Johann Strauss II's "Emperor Waltz" or "Kaiser-Walzer". The waltz was first performed in Berlin on 21 October 1889 which, by the time it would have reached the American West, would indicate a time period of 1890 or later. However since that seems to be much later than other historical references in the show, it may well have been a simple production mistake. The Big Valley main cast. Victoria Barkley, portrayed by Barbara Stanwyck, was the widow of Thomas Barkley. She was the head of the wealthy, influential Barkley family who lived in 19th century Stockton in California's Central Valley. She was the main character of the series. Victoria Barkley was the owner and head of the Barkley ranch. In fact, Stanwyck's refusal to portray Barkley as fragile was controversial at the time. Barkley's husband Tom had been killed six years before the beginning of the series. Victoria Barkley loved and was proud of all her children, including her late husband's illegitimate son Heath, whom she would refer to as "my son". Stanwyck, who went from the refined, elegant lady of the manor to a jean-clad cowgirl as tough as any cowboy, appeared in the most episodes for a total of 103 of the 112 episodes. Her episodes were often surprisingly hard hitting, seeing her character either locked away in a lunatic asylum to prevent her testifying as eyewitness at a murder trial ("Down Shadow Street"), taken prisoner in a prison wagon to replace a dead female convict ("Four Days to Furnace Hill"), impersonating a thief in order to go undercover at a women's prison to report on conditions there ("Alias Nellie Handley"), or trapped underground following a cave-in ("Earthquake"). Jarrod Thomas Barkley, the eldest son, was a respected attorney at law. Richard Long played the role of the educated, refined and calmer of the Barkley sons who handled all of the family's legal and business affairs. While Jarrod, a skilled lawyer, preferred the law to settle disputes, he was known to resort to frontier justice and violence when necessary. He was briefly married in one episode ("Days of Wrath") only to see his new wife murdered with a bullet intended for him. An enraged Jarrod lost his calm and genteel mannerisms, then relentlessly tracked down the killer. He was in the midst of killing him with his bare hands before he was stopped by Nick and Heath. Jarrod was a veteran of the American Civil War. He served as a Cavalry officer in the Union Army. He commanded a cavalry troop of black soldiers as referenced in the episode "The Buffalo Man." Long appeared in 96 of the 112 episodes. Nicholas "Nick" Jonathan Barkley, the hot-tempered younger son, was portrayed by Peter Breck. Nick managed the family ranch. He wore a black leather vest, large black hat and black leather gloves, and was distinguished by his brawling ways and loud demeanor. Nick had served as a soldier in combat in the Union Army during the Civil War as referenced in the episode "Forty Rifles." He was always ready for a fight, and at times would fight with his brothers as well. Underneath his gruff exterior, he was fun-loving, had a great sense of humor, was warm, caring and loved his family deeply. Breck appeared in 101 of the 112 episodes. Audra Barkley, played by Linda Evans, was Victoria's only daughter. Audra was somewhat self-absorbed, bold and forward. Far from demure, she performed daring stunts and rode astride, like her brothers. Like Nick and Eugene, Audra was initially leery of Heath's story that he was her father's son. Early, she attempted to seduce Heath so as to expose him as a fraud, but was unsuccessful. As the series progressed, Audra and Heath formed a very close brother-and-sister bond. Audra also had a caring side as seen by her tending to children at the local orphanage. A few episodes dealt with her romances, and one notable episode was "My Son, My Son" in which Robert Walker Jr. guests as a suitor who proves to be mentally unstable. During the series' final two seasons, Evans' appearances were reduced because she wanted to spend more time with her husband John Derek. Evans appears in 82 of the 112 episodes. Heath Barkley was the illegitimate son of Victoria's late husband, and he had to literally fight his way into the Barkley home. Lee Majors portrayed even-tempered but rough and tumble Heath, who was often angry and aggressive throughout the early episodes due to his belief that Tom Barkley had abandoned his real mother after she became pregnant as well as the resistance he initially received from some of his new siblings. In truth, Tom Barkley never knew about Heath as Heath's mother had never told him, and never told Heath until she was on her deathbed (as revealed in the third episode of Season One, "Boots with My Father's Name".) Heath gradually gained acceptance from the rest of the Barkley clan as the first season progressed until he became as much a "Barkley" as the rest of the family, and his love for them became equal. Heath came to call Victoria "Mother" when speaking to her directly and about her with his siblings. In the episode "Boots with My Father's Name", Heath told Victoria, "you know that there isn't anything that I wouldn't do for you," indicating how deeply he cared for Victoria. Although Nick was initially leery of Heath and felt he had to test Heath's mettle, Heath proved himself worthy of Nick's acceptance, and eventually Nick seemed to grow even closer to Heath than he was to Jarrod, perhaps in a sense due to Heath having more in common with him than did Jarrod. In "The Lost Treasure", the series' season-two premiere, one of a few episodes taken out of the show's initial syndication runs, Heath met Charlie Sawyer (comic Buddy Hackett in a rare dramatic turn), a con man who claimed to be his actual father (the final moments show him admitting he did romance Heath's mother, but left her years before she gave birth). In the same episode, Beah Richards returns as Hannah, the black quasi-nanny who helped raise Heath with his mother. Heath was a veteran of the Civil War as referenced in the episode "The Guilt of Matt Bentell." He served as a soldier in the Union Army in combat operations in New Mexico and was held as a prisoner of war for seven months by Confederate forces. Heath was also established in the episode "The Death Merchant" as having been involved in the Lincoln County War (1878), where he came to know the hired killer "Handy", who had tracked down and killed Tom Barkley's murderer, but who is known by Heath as a merciless killer who changed sides - or played both sides - whenever the money was good. Majors appeared in 95 of the 112 episodes. In addition to the Barkley family members, the episode plots typically revolved around morally conflicted protagonists and antagonists, a common theme in the mythology of the American West in the 19th century. The youngest Barkley son was Eugene, a medical student studying at Berkeley, played by Charles Briles. Like his older brothers, he was known to have a temper as seen in the Season 1 episode "Boots with My Father's Name". He was seen sporadically in eight first season episodes and then episode 21 on a return from college. Then he was drafted into the Army. Only once was his name ever mentioned again. Briles died June 12 2016 at age 70 of congestive heart failure. More Barkley family lore: In one episode, when Victoria is absent, it is explained that she is visiting her unnamed sister in Denver. In the episode "Image of Yesterday", it is revealed she almost married a dreamer named David Wincup (Dan O'Herlihy) before settling with her husband. Douglas Kennedy, formerly of Steve Donovan, Western Marshal appeared 23 times as Sheriff Fred Madden. The regular cast was rounded out by Napoleon Whiting as Silas, the Barkleys' majordomo. In several episodes, his character showed the trauma of slavery ("Joshua Watson"), life for blacks post-Civil War ("The Buffalo Man"), and meaning in his own work for the family ("Miranda"). Despite the series' popularity, the series' ratings never made the top 30 in the yearly ratings charts. The Big Valley was canceled in 1969 as the TV western craze began to fade and to make room for more modern series. In Ella Smith's 1973 biography, "Starring Miss Barbara Stanwyck", Smith noted that The Big Valley had been cancelled by ABC mainly due to a poor time slot. In better times, the series had been enough of a hit to outlive various time slot rivals during its run (mainly on Monday nights at 10 p.m.), including The Jean Arthur Show, Run for Your Life and I Spy. According to Broadcasting magazine (September 27, 1965), its debut episode (actually Wednesday at 9 p.m., where the series aired for half-a-season) placed 39th in the Nielsen ratings for the week of September 13–19, 1965. The Big Valley also was ranked as one of the top five favorite new shows in viewer TVQ polling (the others were Get Smart, I Dream of Jeannie, Lost in Space and F Troop). Early into its second season, The Big Valley was still a mid-range performer, placing 47th out of just 88 series during the week of October 28, 1966, which was higher than such shows as That Girl, Daniel Boone, Petticoat Junction and The Wild Wild West. Even so, The Big Valley was popular enough to warrant at least three TV Guide covers. It also acted as a launching pad for two projected spin-offs from special episodes. A 1968 episode guest starring Van Williams was meant to lead to a Rifleman-like series titled Rimfire. A March 1969 episode, The Royal Road, guest-starring heartthrob Sajid Khan as a young rogue, was also hoped to lead to a series. But by that year the rising popularity of CBS's The Carol Burnett Show — and vocal complaints by Joey Bishop, ABC's late-night talk show host, that the show's faltering ratings weren't helping to provide his program with a proper lead-in — ultimately led to the drama's demise. In syndication, The Big Valley would prove exceptionally popular in the United States, Europe and Latin America. In the comedy film Airplane! (1980), the wacky air traffic controller Johnny, played by Stephen Stucker, paid homage to Big Valley's penchant for big drama in one of his many asides. After Lloyd Bridges' character frets about a pilot who cracked under pressure, Johnny says: "It happened to Barbara Stanwyck!" and "Nick, Heath, Jarrod – there's a fire in the barn!" The Big Valley also has seeped into the darker cinematic subconscious. In Bug, an acclaimed 2006 thriller starring Ashley Judd and Michael Shannon as drug addicts, their characters spiral into a hallucination that leads them to imagine tiny bugs have invaded their dwelling, with one referring to the little critters as "matriarchal aphids" that act "like Barbara Stanwyck in Big Valley." In 1966, for her first season as Victoria Barkley, Barbara Stanwyck won the Emmy for lead actress in a drama series. She was nominated two more times (1967 and 1968) for her work in The Big Valley and earned three Golden Globe nominations as Best TV Star for the part as well (1966, 1967, 1968). And, on March 15, 1967, Stanwyck was named favorite TV actress at the Photoplay magazine awards, which aired as a special episode of The Merv Griffin Show (David Janssen of "The Fugitive" was named favorite TV actor). Richard Long helped present Stanwyck her Gold Medal at the event. The Big Valley was also recognized during its run for its polished production. In 1966 and 1968, the American Cinema Editors (ACE) named Valley the year's Best Edited Television Program (for the episodes "40 Rifles" and "Disappearance", respectively). While The Big Valley is set primarily in and near the city of Stockton, the filming of the series took place in Southern California. A bit of Hollywood history: Nick's girlfriend in "The River Monarch" wears an open weave/knit gray coat with red trim that was worn by Olivia deHavilland as Melanie Wilkes in the Atlanta train station Christmas scene in Gone with the Wind. Stanwyck and Evans in character in one of the later seasons. The theme music was composed by George Duning, who also scored the pilot and four episodes; Lalo Schifrin, Elmer Bernstein and Joseph Mullendore also scored episodes. Paul Henreid, of Casablanca fame, directed a number of episodes. Wilfred M. Cline, A.S.C., Technicolor Associate Cinematographer on Gone with the Wind (1939), was director of photography of several Big Valley episodes, together with Chas E. Burke, A.S.C. Dell Comics published a short-lived comic book for six issues in 1966-69. (The last issue reprinted the first, and came out two years after issue #5). All issues had photo covers. Film columnist Patrick Goldstein reported in the Los Angeles Times in July 2009 that filmmakers Daniel Adams and Kate Edelman Johnson were producing a feature film version of The Big Valley with production to begin in April 2010 in New Mexico and Michigan. In 2012, the aforementioned film version of The Big Valley, which was to have first starred Susan Sarandon and then Jessica Lange in the role of Victoria Barkley, was put on hold indefinitely after the film's would-be director, Daniel Adams, was indicted for fraud pertaining to two previous films and sued by investors in "Valley" who claimed foul as well. Several episodes of the original TV series have been combined into concurrent running feature-length TV movies, while the notable two part episodes: "Legend of a General" and "Explosion!" have also been made into feature-length TV movies. These have been issued as TV movies on DVD as a box set, along with seasons one and two. 20th Century Fox Home Entertainment released the first season on DVD in Region 1 on May 16, 2006. Season 2, Volume 1 was released on January 30, 2007. On January 8, 2014, it was announced that Timeless Media Group (TMG) had acquired the rights to the series. They have subsequently released seasons 2 & 3 on DVD. The fourth and final season was released on October 28, 2014. In Germany, all four seasons have been released as individual season sets, plus a complete four season box set in region 2 PAL format. ^ "They Called Her Delilah." aired Sept 30, 1968, second episode in the fourth and final season. ^ "The Best of Johnny from Airplane! from AirplaneFan". Funnyordie.com. 2008-10-09. Retrieved 2014-07-16. ^ Solomons, Jason (November 10, 2007). "Bug". The Guardian. London. ^ "The Remake Watch: 'Big Valley' edition". Los Angeles Times. 2009-07-15. Retrieved 2009-07-26. ^ Fernandez, Jay A. "Susan Sarandon eyeing 'Big Valley'". The Hollywood Reporter. ^ "Movie Director Indicted in $4.7 Million Tax Rebate Fraud Case". The Hollywood Reporter. December 12, 2011. ^ "Courthouse News Service". Courthousenews.com. 2012-07-31. Retrieved 2014-07-16. ^ a b "The Big Valley DVD news: Revised Artwork No Longer Worth $12 Million". TVShowsOnDVD.com. Archived from the original on 2014-07-30. Retrieved 2014-07-16. ^ "The Big Valley DVD news: Revised Box Art for The Big Valley - Season 2". TVShowsOnDVD.com. 2014-01-31. Archived from the original on 2014-07-30. Retrieved 2014-07-16. Wikimedia Commons has media related to The Big Valley.